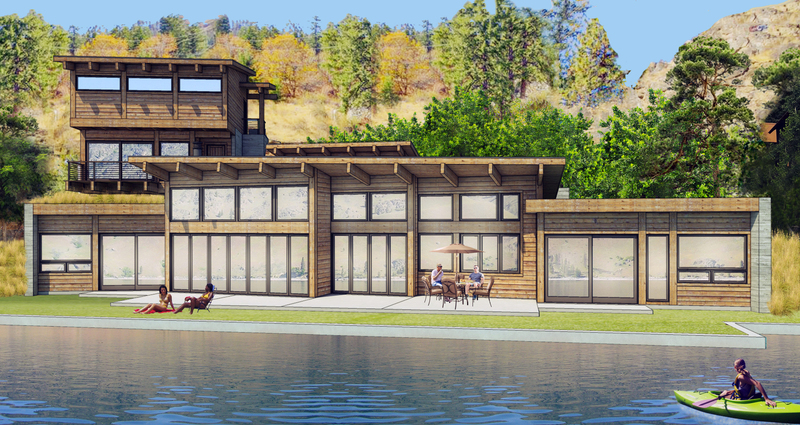 This extremely steep site located on the shores of Lake Chelan provides the backdrop for this recreational cabin. The client desired to have the main living space be just a few feet above the high water level of the lake so upper pavilions like the garage and a small bunk room terrace down the bluff leading to the entry to the lower main lake house. Simple natural materials like architectural concrete, livened edge wide plank cedar siding, and timber framing for the roof are all exposed and comprise the main structure of the house.